Disk Management saying "Disk not initialized"
My laptop has 2 drives: a 120Gb SSD with Windows 7-64 on it and a 1Tb HDD with all data. Windows Disk Management shows 1Tb HDD as unallocated and suggests initializing. I haven't performed this operation yet because I'm highly afraid this might affect data integrity and hinder the recovery somehow. Using DMDE software wasn't successful - the scanning wouldn't start at all. Same thing with some other recovery tools. I have read instructions and this is not how it is supposed to look like, as I know. I don't like these Partition: Read Error, The harddisk seems too small and The following partition can't be recovered messages and I don't know what to do from here since I'm quite a newb with all this stuff, though I'm trying to be careful. Is it possible that my drive is protected/locked somehow? I appreciate any help with this, this data is quite important for me and formatting the drive is not an option. 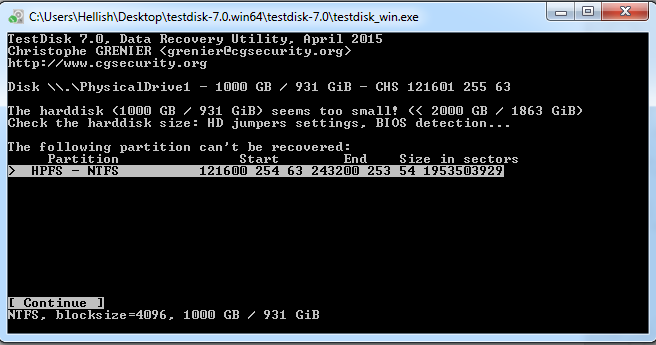 Re: Disk Management saying "Disk not initialized"
As administrator, run TestDisk, Advanced, Boot, RebuildBS, List. If you can see your files, choose Write, confirm, Quit and restart your computer. 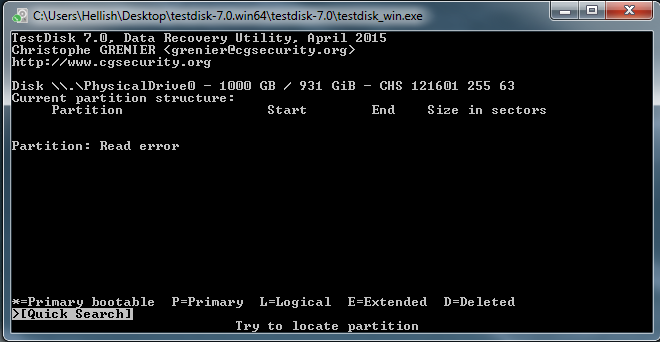 cgrenier wrote: As administrator, run TestDisk, Advanced, Boot, RebuildBS, List. If you can see your files, choose Write, confirm, Quit and restart your computer. Can it somehow affect data on the drive? Really don't want to lose it. Should I analyse the HDD first and then press "Advanced"? filewin32_getfilesize(\\.\PhysicalDrive2) GetFileSize err Неверная функция. filewin32_setfilepointer(\\.\PhysicalDrive2) SetFilePointer err Неверная функция. filewin32_getfilesize(\\.\E:) GetFileSize err Неверная функция. filewin32_setfilepointer(\\.\E:) SetFilePointer err Неверная функция. filewin32_getfilesize(\\.\F:) GetFileSize err Неверная функция. filewin32_setfilepointer(\\.\F:) SetFilePointer err Неверная функция. filewin32_getfilesize(\\.\I:) GetFileSize err Неверная функция. filewin32_setfilepointer(\\.\I:) SetFilePointer err Неверная функция. I tried as described above but no success. Is it possible to do something about this issue?